There are many ways to save money as a homeowner, and most of them involve some sort of investment with a greater savings than the investment as time progresses. Whether it is changing your A/C filters monthly, or xeriscaping to require less water, or tinting your windows to protect in a storm and to lower your cooling bill, all of the investments usually pay off over time. This next tip will pay off immediately, especially if you are able to install the meter yourself! The water bill you receive will have many charges on it that are itemized by your water usage if you are on city or county water supply, and you should know what those charges are. The one I have an issue with is the sewage charge that is normally placed on every gallon that flows through that main supply line regardless of where that water is actually headed. I water my lawn regularly to maintain it and to abide by my homeowners association by-laws. I know there is no sewage treatment applied to the water used for watering, and I also know that to be the case for the water used in my pool. So, here is a little known tip for saving the majority of the charges on those gallons of water – a separate irrigation meter. What is an Irrigation Meter? You might be asking what is an irrigation meter and why would I want one – simple. 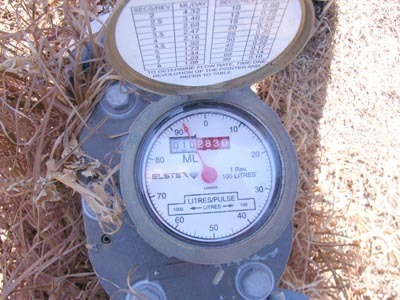 An irrigation meter is a separate meter that is installed before the main supply line reaches the main meter, and it measures usage for water that will be used for those applications that do not require sewage treatments. This is usually why your utility company will demand to be aware of your change and sometimes (as in my case) involved in the process. The first thing you should do is call your water company, and ask them their policy on irrigation meters. In both of the towns where I manage properties, I have had to notify my county and city water companies, and in the smaller city I was required to pay for the city utility workers to install the meter. Normally, there will be rules surrounding the meter and how it is installed. For instance, you will likely have to prove via inspection that the meter will only supply a sprinkler system, possibly your pool, and in some cases may allow for a hose bib to attach for your hand watering that may be necessary. Some municipalities will not allow this extra meter due to city ordinances and also those Do-It-Yourselfers who will pass the inspection and then attempt to bend or break the rules governing approved supply appliances. Be sure to check with your local governments on the applicable codes for your own situation. 1. The first thing will be to locate and close the main water supply prior to the meter, and it may require a formal request from the water company to have that done. 2. Once closed, you will need to insert a forked pipe that will split the supply to the two separate meters. This will involve cutting the supply line between the closed water valve and the meter, always being sure to leave enough space on either side of your cut to allow for the next piece of pipe to fully connect and create a seal. You will want to be sure to install on each of these branches a valve that will allow the utility company to close one or both of the valves in case of emergency. 3. Place the separated meter back onto one of the forks in the splitter pipe, and place a new meter on the other side. 4. You will need to then pipe the new meter to the supply line for the sprinklers as well as installing any hose bibs or pool feed lines that are allowable. In this process, you will also need to accommodate the box that will house the new meter and allow the water company to read it on their schedule. This is usually just placing the new double casing over the two meters, but depending on your plumbing it could require two separate boxes installed to cover each of your meters individually. I hope this has been helpful for you because I know that it has saved us an average of $40 monthly on our water bill at the least impacted property. In the end, our cost for paying the city to install the second meter at our other property totaled $512.00, and that cost was offset in savings after 13 months. The following two years have been purely savings. The first home allowed me to install the irrigation meter myself, and I spent around $285 in permits, meter, plumbing supplies and inspections. This home has much less area to maintain, but the pool is where we have seen the majority of our impact. Our savings at the first home have been in excess of $75 monthly, and paid for the new meter in only 4 months. Best of luck in all of your projects. This article was supplied by Joe Schembri with U Fill or We Fill, Tampa Bay’s Dumpster Service. U Fill or We Fill is a 100% family owned and operated Tampa junk removal company that serves the entire Tampa Bay area and creates DIY articles to help save people money.